Situated in an elevated position with splendid views over the glistening Towy Estuary, this detached holiday home is located just a stone's throw away from the unspoilt coastal village of Llansteffan, offering a perfect getaway for a family or couples looking to explore the beautiful coastline of Carmarthenshire. Deceptively spacious, Llety-R-Wennol has been attractively put together with en-suite bedrooms, a large living area and a contemporary style dining room/kitchen. Guests can enjoy the indoor games room equipped with a pool table, or venture outside and relax on the private patio whilst watching the wildlife flourishing, where otters, kingfishers and red kites can be spotted on a clear day! The picturesque Millennium Coastal Path is just a short drive away which occupies 13.5 miles of breathtaking coastline, along the shores which leads you to the scenic Pembrey Country Park with its golden beaches, dry ski slope and horse riding trails. 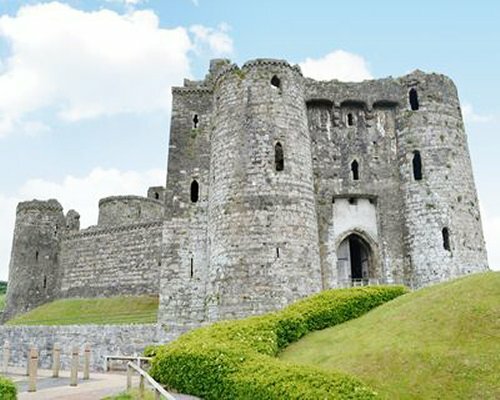 Away from the coast, Carmarthenshire countryside is just as promising with its array of charming market towns including Carmarthen and Llandelio, as well its enchanted medieval sites dotted around the county including Kidwelly, Llansteffan and Laugharne castles along the coast. The Pembrokeshire border is within easy reach and is home to the popular coastal resort of Tenby, with its cobbled streets, sea food restaurants and award winning leisure attraction including Oakwood and Folly Farm. Beach 2 miles. Shop 4 miles, pub and restaurant 1 mile. From Carmarthen going west, follow signs for St. Clears then take first turning left, after B&Q, signed Johnstown and Llansteffan. From St Clears, follow Carmarthen signs and take left turn signed Johnstown and Llansteffan, near Showground. Continue through Johnstown and onwards to Llangain. Continue through village and towards Llansteffan. After approx 1 mile, look for left turn up farm track (sign shows Polroath and Nantllyn). Immediately opposite the signs on the right is the driveway for Llety-R-Wennol holiday home situated in an elevated position.